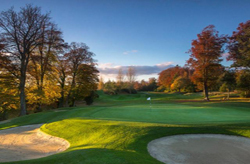 Take a break from the hectic bustle of day to day life and let your senses be soothed by a meandering journey through 18 challenging and beautiful holes of golf at Mount Wolseley Golf, a popular choice for golfing in Ireland and Carlow. From the beginner to the more experienced golfer, this masterful Christy O'Connor design will remind you of the reason you first swung a golf club. Like a fine wine, this lush championship parkland golf course has matured beautifully with age, with rich surrounds, mature trees and playing surfaces unrivalled for their consistency and quality. Located only one hour from Dublin, Kilkenny, Waterford and Wexford in the Southeast, and with stunning views of the Carlow mountains, this traditional Irish parkland golf course will remind you of the relaxing side of life. Located close to Tullow Town in County Carlow.